While a full garden for me is a little ambitious, I tested my green thumb by lining my back deck with decorative pots filled to the rim with my favorite herbs. 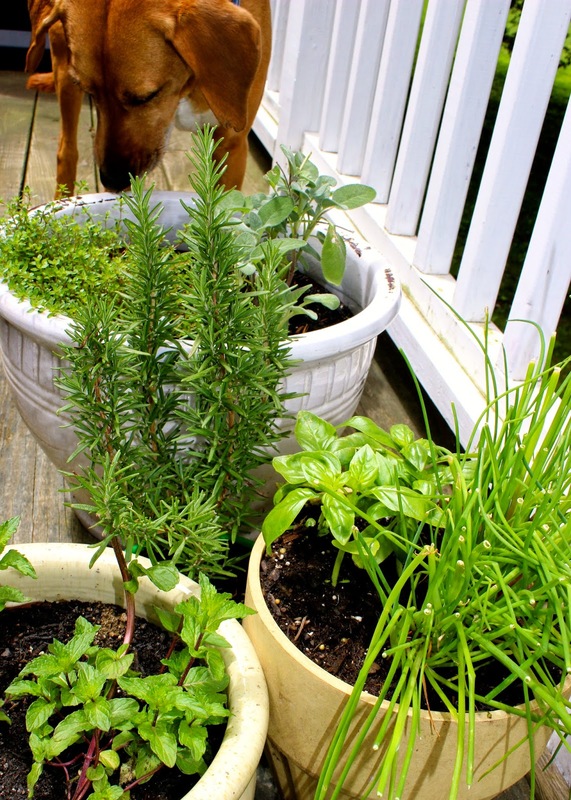 With summer entertaining in mind, I planted herbs that I could use in both savory and sweet dishes- basil, thyme, rosemary, chives, sage and Marni's and my favorite, mint. 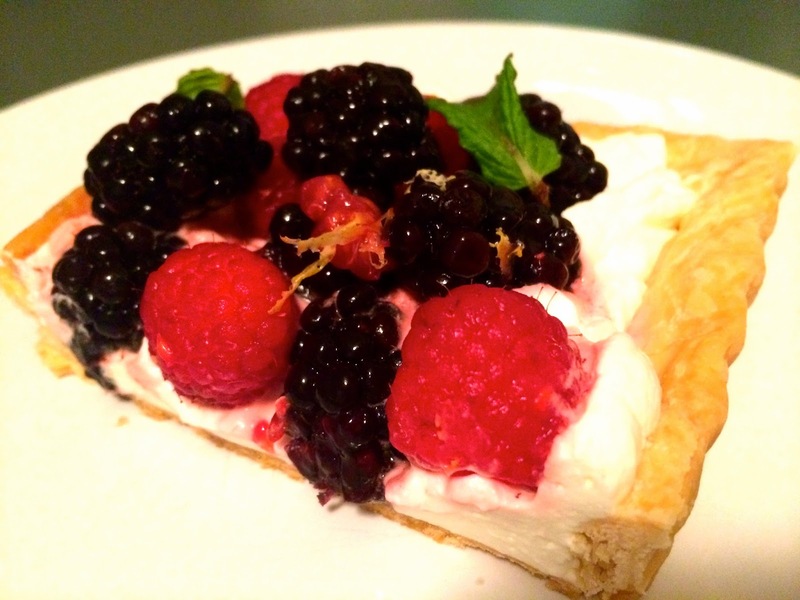 With an abundance of mint overflowing my poor pot, I clipped off a handful to add a refreshing twist to a berry tart. I grabbed some dough from the freezer and draped it into my favorite rectangular-fluted tart tin. I infused a simple syrup with the mint to add a crisp, aromatic touch to some fresh whipped cream. I dolloped the cool cream atop the prepared shell, and then tossed a mix of sugary lemon berries to place on top. Not only was this a crazy blend of flavors and textures, the pops of berry colors along the tart created quite the sophisticated spectacle. On a floured surface, roll out dough into a long rectangle and place in a 13 1/2-by-4 1/2-inch rectangular fluted tart pan. With a knife, trim the crust all around. Pierce the middle all over with a fork and bake until slightly golden, about 15-18 minutes. Place a metal bowl and electric mixer whisk inserts in the freezer. For the Minty Simple Syrup, in a small saucepan, heat 1/8 cup of water with the 1/4 cup of granulated sugar over medium high heat. Bring to a boil, stirring occasionally until the sugar is dissolved, about 3-5 minutes. Remove from heat and stir in the fresh mint leaves. Let steep for 1 hour. Meanwhile, toss the berries with the lemon juice and sugar in a large bowl. Set aside. Pour the chilled heavy whipping cream into the chilled metal bowl. With a fine sieve, strain the minty syrup into the bowl. Add the vanilla extract. Whip the cream until soft peaks form. Spread the whipped cream mixture generously and evenly atop the prepared shell. Pour the berries over the whipped cream and garnish with fresh mint leaves and lemon zest. While it is tempting to indulge right away, I recommend letting the tart set in the refrigerator for at least a half hour before serving. Serves 6-8. Can’t wait to experiment with the other aromas and flavors from my sprouting herb collection!